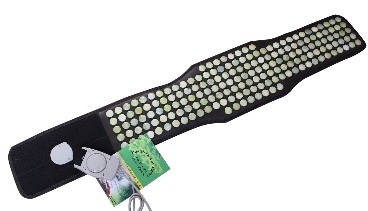 The InfraMat Pro Belt-J combines the healing benefits of far infrared (FIR) heat with the rejuvenating properties of jade to encourage healing and relaxation. This may encourage healthy blood circulation and oxygenation throughout the body, and allow more nutrients to reach the affected muscles. FIR therapy may help improve a variety of conditions including muscle, joint and bone pain, headaches, insomnia and more. In addition to FIR therapy, the InfraMat Pro Belt-J also uses negative ion and photon therapy. Negative ion therapy may promote healthy skin and bones by increasing collagen production. It may also help cells and tissues absorb nutrients more easily and heal from injury and illness. Negative ion therapy has also been shown to decrease symptoms of anxiety and depression. Only the highest quality pieces of semiprecious jade are used for maximum effectiveness.